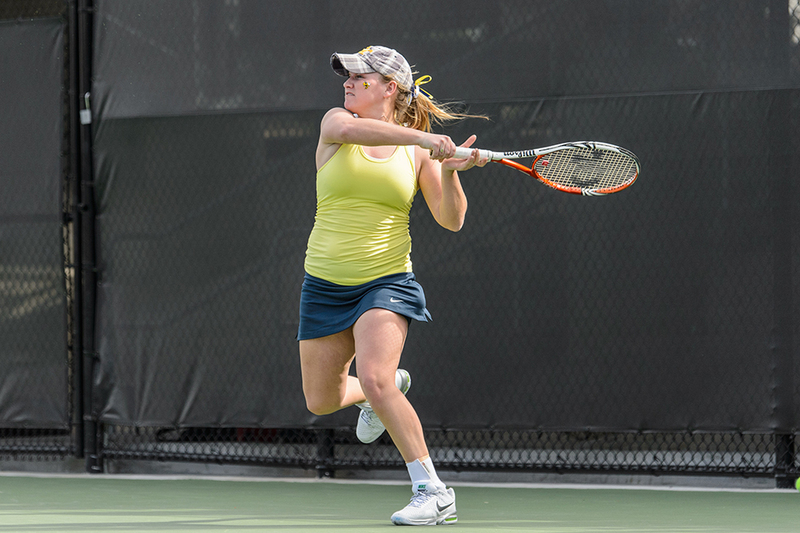 The Jackets’ women’s tennis team begins its 2014-2015 season with a refreshed roster and a promising future. The team is quite young, with three juniors making up the oldest segment of the roster. One of those players is Megan Kurey, who along with fellow junior Kendal Woodard had a successful doubles season last fall. Kurey believes that this year is going to only get better for Tech. “We have nine players this year. The past two years, we’ve only had six players, and we need six to play. That’s been pretty rough, so coming in this year, we’re just really excited to have many girls with a lot of talent,” said junior Megan Kurey. Four of those nine are freshman who have come from all around the world to play at Tech. Kurey believes they have some great potential with the Jackets. “All of our freshman are really talented. Johnnise just got back from the Junior US Open and played pretty well, so that’s exciting. We have Paige from New Zealand who is really talented, and we look forward to see how she does. We have Alexis from Canada who’s a grinder. And Vooha, who’s a walk-on, is working hard and proving herself,” Kurey said. Alexa Anton-Ohlmeyer and Rasheeda McAdoo are the two sophomores on the team. Natasha Prokhnevska is the other junior on the roster and, along with Kurey and Woodard, is part of the team’s leadership. Kurey, who is the oldest player on the team, is prepared for this increased role thanks to her experience from her first two seasons. “My freshman year, I had a great captain. Last year was same thing. Just learning from them the past two years has really prepared me for this year, and I’m just excited to be one of the leaders this year,” said Kurey. Kurey and Woodard paired up last year to become one of the best doubles teams in the nation. The pair won the 2013 National Indoor Intercollegiate Doubles Championships and the Southeast Regional Doubles Championship and were ranked as high as #1 nationally in February. However, a couple of factors may prevent the two from continuing that success together this year. The team’s youth may force Head Coach Rodney Harmon to pair the two up with younger players. “Since we have so many new players, we may have to be split up. Last year was a lot of fun, but just with all of the new players this year, he’s going to have to try different teams and make it better for the team to win the double point,” Kurey said. Moreover, Kurey has been dealing with an injury and may not be able to play for at least another month. Considering those two factors, Kurey is excited when looking at the team’s future. In particular, the team is eager to play a certain other school in the state. “We’re really excited for Georgia. Last year, we [did not have] a very good match at all, so with all the new players, we’ll be ready for them this year,” Kurey said. The team’s confidence is apparent in their goals as well. “We all want to be top 10 as a team, which I think we have the capability of doing. We finished number 18 last year with six girls, so with nine girls that are all very talented, I think we can definitely do that,” Kurey said. The Jackets begin their season at home on the weekend of September 19 at the Georgia Tech Invitational against LSU, Georgia State and NC State.